Cloud services sharing not working in Virtual Machine. I do not see the Dropbox, Google Drive shares in my Windows Virtual Machine. 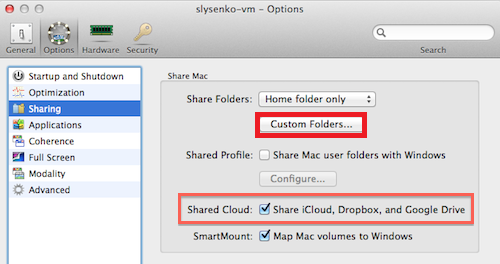 The option labeled "Share iCloud, DropBox and Google Drive" does show as checked in my VM configuration. I have even tried disabling it and restarting, re-enabling it and restarting. It didn't make a difference. Make sure that the option 'Share iCloud, Dropbox and Google Drive' are selected. Click on 'Custom Folders...' > click '+" sign and add your folders from iCloud, Dropbox and Google Drive manually, one by one. Check the issue in Virtual Machine. If it works fine now, please go back to 'Custom Folders...' and remove manually added Folders from the list. Now the iCloud, Dropbox and Google Drive volumes should work without any issues.